he XMIX is a versatile mixing/crossfading utility module with Wiard flair. There are level controls for the two inputs (X and Y). The Y input can be inverted via a switch. Z controls the balance of X Vs. Y. Z has a CV input, along with an attenuator for CV amount. Positive and negative outputs are provided, as well as an Expand input which provides a unity input to chain the output of other modules (such as another XMIX). Read more below! 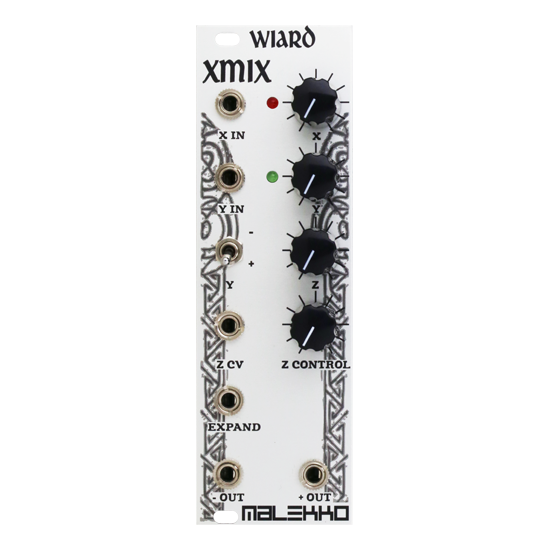 The Malekko Wiard XMIX is one in a series of modules offering the same great sound, ergonomics, musicality, and quality that made the Wiard 300 series legendary, at a fraction of the cost and size in Eurorack modular format. The XMIX is a versatile mixing/crossfading utility module with Wiard flair. There are level controls for the two inputs (X and Y). The Y input can be inverted via a switch. Z controls the balance of X Vs. Y. Z has a CV input, along with an attenuator for CV amount. Positive and negative outputs are provided, as well as an Expand input which provides a unity input to chain the output of other modules (such as another XMIX).